I’ve seen a lot of terrific art exhibitions at venues all over the world, but rarely have I seen one where the curator is front and centre like Dot Tuer’s fabulous new show at the Art Gallery of Ontario, Frida and Diego: Passion, Politics and Painting. 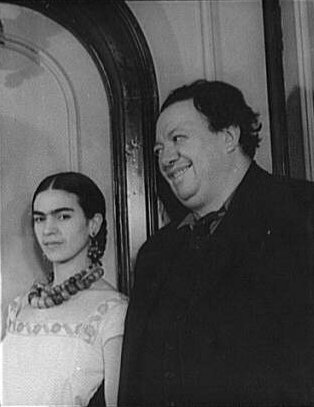 The exhibit would be enough with the art work of either Frida Kahlo or Diego Rivera. Put them both together, sprinkle in some excellent period photographs of the couple and you have a magical insight into the tumultuous lives and the marriages of these Mexican artists (yes, they were married to each other twice). Dot Tuer, the curator, is a professor at OCAD (Ontario College of Art and Design) in Toronto. Her biography states: “Dot Tuer is a writer, cultural theorist and historian whose research focuses on issues of postcolonialism, transculturation, indigenous-European encounters in the Latin American colonial period, and the intersections of history, memory, and hybridity in contemporary art”. I don’t know about you, but this doesn’t really tell me very much. It’s a bunch of academic jargon. A better insight into Dot Tuer can be found in her excellent article about Jeff Wall. Dot Tuer does know how to set up a great juxtaposition. The highlight of the show for me was pair of portraits, one done by each artist, of a female friend of the two of them. Diego paints the friend of the family as a blonde bombshell with long, sweeping strokes of the brush. The canvas is large and the subject is portrayed reclining on a lounger, with long legs and red lips. Frida, with her tiny, precise brushstrokes, paints just the face of her friend. You see all the wear and tear of the woman’s life in her face, with dark lines under the eyes and a world-weary look. If the two works weren’t presented side by side, you would never suspect that the two portraits were of the same person. This seems to sum up the world view of the artists. Diego, the optimist, the one who viewed the world as a place where communism and a future utopia were taking root, painted to inspire. 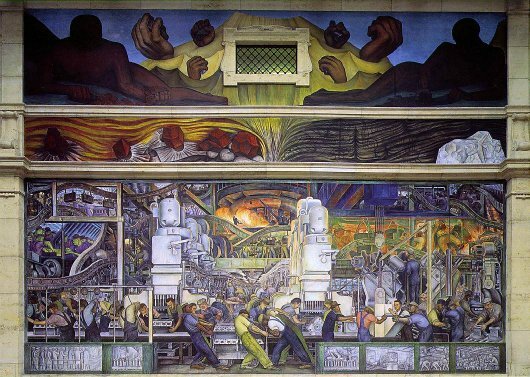 He had big ideas about industry and commerce and painted huge murals that glamorized assembly lines and machines. 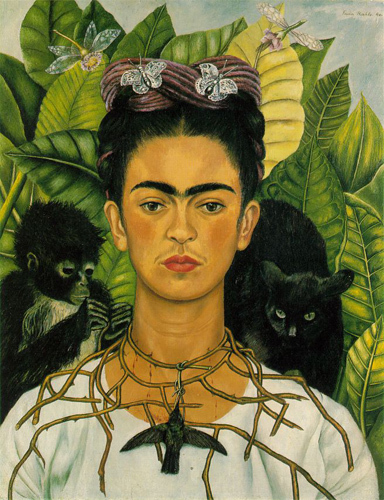 Frida, the pessimist who had suffered so much in her life, painted her reality. It was a reality of pain, of physical hardship and suffering. Little wonder that their relationship was tumultuous. Diego loved to travel and spread his ideas around the world. Frida wanted to go home to Mexico and cocoon in the house where she was born. And yet, after affairs, an acrimonious divorce and years of living apart, they reconciled and re-married. Each must of fulfilled a void in the other. This show is a “must see” for those near Toronto for the wonderful paintings, the photographs of the period and for the way the lives of these two artists come to life by placing their work side by side.